Living in the south, I simply cannot face summer without a nice big glass of iced tea. I'm always on the lookout for new tea blends, so I was excited to discover the Paisley Tea Company. 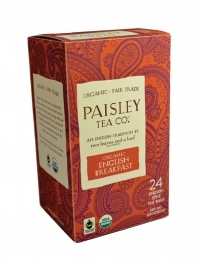 The Paisley Tea Company offers a wide range of delicious tea blends which also are USDA certified organic and fair trade. I received two generous boxes of their tea to try, and I the first thing that struck me was the beautiful paisley pattern on both the outer boxes and the inner bag. So pretty! The tea bags are "English style." Paisley Tea explains English style this way: "because of the increased surface area of the tea in a traditional paper teabag (as opposed to tea in its whole leaf form), each cup brews up quickly with bold, strong flavor. We think of it as "everyday tea," or as our founder and CEO says, 'You don't think, you just drink it. Brew it up, add some milk and there you have it.'" However you explain it, it makes for a delicious cup of tea! The English Breakfast tea was the one I was most anxious to try, since I am a early-to-mid-day tea drinker. Since the tea comes packaged in the paisley bag, it retains a lovely smell when opened. The tea bags are attached two by two, but are easily separated! I steeped mine for a few minutes, and the tea was a lovely dark shade of brown. The tea is very mild and there was no unpleasant aftertaste like you get with some inferior types of tea. This English Breakfast tea is a blend of Indian and African teas and is delicious with or without milk (I'm a sweet tea, no milk girl myself!). The Decaf English Breakfast tea was also a lovely rich brown color and I could taste no difference between it and its more hyper relative! The motto of the Paisley Tea Co. is "More Than One Might Expect" and the tea certainly lives up to that: each tea bag features 10% more blended tea, so there is more robust flavor available from each bag. The English-style tea is grown in a way that ensures respect to the environment. Richard Rosenfeld, the founder of the Two leaves and bud tea company, visits the farmers who grow the tea used in the Paisley Tea Co.'s products, ensuring that both the farmers and the environment are being well-treated. Although we're in the middle of a summer heatwave, there's nothing better to help you cool down than a nice cup of tea -- I prefer mine cold, but the hot version is also effective, I'm sure! Disclaimer: I received two packages of tea to try for the purpose of this review from Paisley Tea Co.